This ASCD Study Guide is designed to enhance your understanding and application of the information contained in When Teaching Gets Tough: Smart Ways to Reclaim Your Game, an ASCD book written by Allen N. Mendler and published in April 2012. Most of the questions contained in this study guide are ones you can think about on your own, but you might consider pairing with a colleague or forming a study group with others who have read (or are reading) When Teaching Gets Tough: Smart Ways to Reclaim Your Game. While there has been much written that touts the benefits to achievement of many factors like class size, block scheduling, differentiated instruction, and various instructional programs, what is the only research proven factor that has consistently been shown to increase student achievement? What characteristics or behaviors do teachers have in common that are most closely associated with student success? Most businesses work on a pay-for-performance model and common sense suggests that more effective employees should receive greater pay. Yet even in the business world, pay has not been found to be a sufficient incentive to motivate top-notch performance. What practices are generally seen in organizations that are able to get and keep the best employees? What does the book suggest are the two most important attitudes for teachers? It is suggested that the attitudes held by employees at the Pike Fish Market in Seattle, Washington are applicable to teachers. What are they? Identify at least two behaviors you can embrace every day that reflect each of these four attitudes: Play, Make their day, Be there, Choose your attitude. What are the obstacles at school or that you put in the way that prevents you from moving more in the direction of any or all of these attitudes? Can you think of any ways to address these obstacles? What are some ways your colleagues can live these attitudes for each other at your school? What are the four main challenges that lead to teacher dissatisfaction identified in the book? Do you agree with these? Are there any others that need to be addressed? There is a comment about change that says "culture changes after people change." This implies that lots of little changes equals a big change. Even if your school is already a great place, what are some "little changes" that you think might make your school even better? Can you identify the six pillars that should guide you when working with difficult students? Identify at least two quick strategies for each pillar that you can do every day. It is suggested that you let your students know that there is no way to fail your class if they follow the three P's--Prepare, Plan and Practice. With diverse learners of varying ability in most classes and an emphasis on meeting standards and passing tests, what are some ways to actually make these P's lead your students to success? Ownership and choice empower people. Identify at least six practical ways you can involve your students meaningfully in the day-to-day classroom routine to give them a sense of ownership? There are many ways of offering choice (test questions, which questions ones to do for homework, where to sit, when to complete an assignment, etc.). List as many specific ways of giving choices that you can think of in your classroom. One of the suggestions given is to find something positive every day for two weeks about each of your difficult students and express that to them. It is easier to do this when you compare each student to himself rather to some "objective" standard. Start making your list! What are five encouraging statements you can use every day? Put together a more detailed plan for problem prevention using the six pillars framework. What are the most important goals you want to achieve when misbehavior is happening? There is a four-step process suggested that you can use to stop most misbehavior quickly. What are the four steps? Imagine a student is pushing your buttons and says or does something you find objectionable. If possible, get together with a colleague and role-play. Ask your colleague to say or do what the student does that bothers you and practice using each of the four steps. Identify at least three other things that are recommended to say or do if the four-step plan doesn't work. Kicking kids out of class should be done only under two conditions. What are they and do you agree? What are the major problems created when students are referred elsewhere? The hardest part for most teachers is to remain calm when kids say or do offensive things. Identify some of the specific suggestions that are offered to help you stay personally connected to your students without taking their offensive behavior personally. Many of the kids who complain about rules claim the rules are stupid. Do you ever agree? What are some things you might do in your school to get a rule changed if you think the rule is stupid? Assuming you can't get the rule changed, practice enforcing a 'stupid' school rule without owning it. What are some of the best ways for administrators to support teachers when kids misbehave? Human nature seems to make us more inclined to notice when things are not running smoothly. What good deeds do you do regularly that go unnoticed? Who do you wish would notice more? Stephen Covey, famed for his Seven Habits of Highly Successful People, advised that you "give before you get." What positives can you share with the people that you wish would notice more of the positives that you do? One of the suggestions offered in this chapter is to seek your own compliments. If you asked your students to write down two things you do that helps them be successful, what do you think they would say? At open house, what do you think parents might write if asked to share the most positive thing they have heard from their child about your class? If you want to influence a colleague or administrator, how do you think they are likely to be either more favorably recognized, gain in stature, or experience life more enjoyably if they gave you what you need? Identify at least three ways to get more support from administrators. Change is usually easier for people to embrace when they don't feel forced to let go of the familiar. Ask for change little by little. What systemic issues exist that contributes to making your life unpleasant (e.g., certain school rules, inadequate student supervision, inconsistent enforcement)? Identify one "little" thing within one category and develop a plan for getting that to change. There are four ways to hear a negative message that is directed your way. What are they? Which two ways are best in steering the conversation towards a more helpful outcome? How we react is at least in part tied to how we view something or somebody. Further, if you want someone to change, it can be enormously helpful to first see the strength in the behavior you find bothersome. What is the positive side of an annoying parent, stubborn colleague, or unsupportive administrator? How might you or your students actually benefit from an angry parent, stubborn colleague, or unsupportive administrator? Imagine yourself sharing an appreciation about the very behavior you wish would change. What would you say? Identify at least six ways to get and maintain support from challenging parents. What aspects of "Habitat for Humanity" might provide you with more of the support or supplies that you need to do your job most effectively? One of the winners of the CNN Heroes Award was a teacher in the Philippines who has a "pushcart classroom" and teaches in the streets in impoverished, gang-infested neighborhoods. What characteristics or traits do you think he possesses that enable him to continue to teach? Of these characteristics, which ones could benefit you if you developed more of them? Identify at least three ways to make better use of either your colleagues, other students in your class, other students from other classes, community volunteers, or parents to enrich learning or help with behavior. What are some things you can do to raise additional funds to support your instructional goals? If you could sell naming rights to components of your classroom, what would be the components be (e.g., The Widgets Inc. Reading Corner)? Naming rights to components of your school? Identify at least two ways you could have students use their cell phones to enhance instruction. What are two things you could do to the physical environment of your classroom to brighten the mood? Who might help? Where could you get any needed supplies? A major cause of teacher burnout is a sense of isolation. Identify at least three specific ways administrators can help teachers feel more connected. Among the "attitude adjustment activities" identified are: challenge yourself, stay open to new possibilities, and do your best but then turn the page. What do each of these mean to you? What are some new challenges you might give yourself if bored? Are there any creative ideas you heard recently that you were quick to dismiss? What might happen if you gave these a bit more consideration? What is the best way to know when it is time to stop banging your head against the wall and turn the page? How do you think keeping a journal of what you have to be thankful for could lead to greater job satisfaction? How could your students benefit from doing this? Their parents? Everyone at school? There are several strategies offered to promote "mindfulness" of self and others. What does "mindfulness" mean to you? Identify two ways to practice mindfulness. What are three quick things you can do, either on the spot or in very little time, to relax when stressed? One of the ways to both relieve stress and boost happiness is through physical activity. Name three physical activities that can provide great benefits in 10 minutes or less. What benefits for students have been associated with physical activity through considerable research? What are three practices you could implement in your class to provide these benefits? 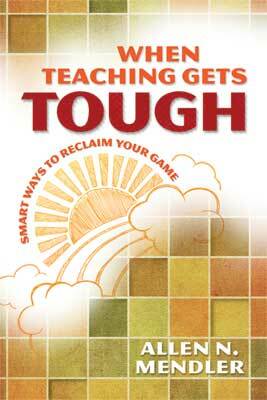 When Teaching Gets Tough: Smart Ways to Reclaim Your Game was written by Allen N. Mendler. This 190-page, 6" x 9" book (Stock #112004; ISBN-13: 978-1-4166-1390-9) is available from ASCD for $19.95 (ASCD member) or $26.95 (nonmember). Copyright © 2012 by ASCD. To order a copy, call ASCD at 1-800-933-2723 (in Virginia 1-703-578-9600) and press 2 for the Service Center. Or buy the book from ASCD's Online Store.